As one of the most affordable and enjoyable rounds to shoot, .22 long rifle ammunition has long been a staple of many American households. This .22 Long Rifle Remington Target 40 grain lead round nose is economic and accurate, and just the round you need to elevate your shooting skills above and beyond the competition. Intended for competition target shooting purposes, the Remington Target .22 LR 40gr LRN flies as flat and true as its design was intended. The 40 gr. swaged lead round nose bullet is ideal for cowboy action shooting as well as competitive target shooting. 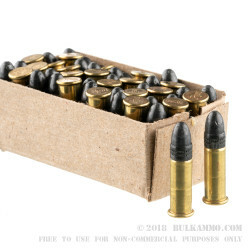 Due to the Remington Target .22 LR 40gr LRN averages a muzzle velocity of about 1,150 feet per second, this ammo also works well straight out of the box. 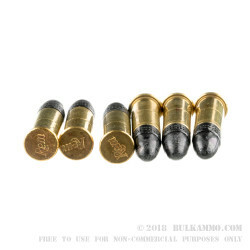 The highly polished brass rimfire cartridges are 100% reliable, and can be reloaded to be used in revolver, semi auto, and long rifle based shooting platforms. 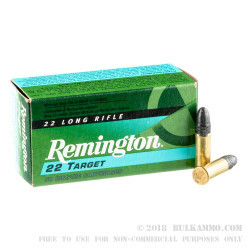 Enthusiast looking for an economic round with serious shooting potential will not want to leave home without a box of the Remington Target .22 LR 40gr LRN.